Despite Apple recently adding a 128GB option to the iPad 4, storage space on iOS devices is still a problem for people who love to watch HD movies on the go. The Corsair Voyager Air is a 1TB external hard drive (there's also a cheaper 500GB model) that can connect to your iOS device over Wi-Fi, letting you watch video, view photos and open other files stored on it, leaving the storage on your device free to be used for apps and games. You can load files from your computer onto the Voyager Air using a USB port, or by plugging it into your home network using its Ethernet port, making it act like normal network storage, so any computer can access or load files. It also acts as a media server, letting you watch videos on compatible games consoles and set-top boxes. Here, we'll concentrate on the iOS support. 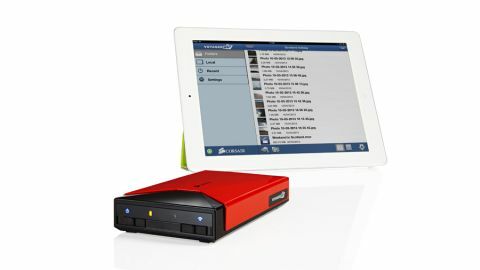 This hard drive is most useful on the go, thanks to its built-in battery and the ability to create its own Wi-Fi hotspot. To access the Voyager Air from your iPhone or iPad, you'll need to download the accompanying free app, which will detect the unit and connect, provided you're connected directly to its Wi-Fi hotspot. The app won't detect the Voyager Air through your home network, sadly. Still, it means that wherever you are, you can just flick on the Voyager Air's Wi-Fi switch and then connect to your iPad in the Settings app. The battery is rated for around seven hours, which isn't brilliant, but should be good enough for most purposes. The Voyager Air comes with both a mains and car charger though, so it isn't a problem to top it up (but bear in mind that it doesn't charge from a computer when connected through the USB 3.0 cable). Connecting to it is simple, and the app immediately shows you all the files and folders stored on it. There's no media sorting (letting you just view, say, videos) or search function, so you'll need to make sure that you organise everything into tidy folders. The app isn't the prettiest, but it does its job well, and up to five devices can access it at once. Files and videos that iOS supports natively can be viewed right in the app, so you can watch movies, browse photos and read some documents. All movies we tried (including high-quality 1080p videos) played smoothly with no obvious deterioration from being streamed; photos looked good, though the app struggled with rotation, displaying some sideways or upside-down. For files and even video types that aren't supported by iOS, you can use the Open With command in Corsair's app to send these files to a different app that's capable of reading them. So you can open MKV or AVI videos in AVPlayer, open spreadsheets in Excel, or open text documents for editing in the likes of Pages. There are some other features we feel the Voyager Air is missing - internet sharing over Ethernet and remote access most of all, though the latter is planned in an update - but on the whole, it's the most capable external storage for iOS we've seen yet. It's not cheap, but for those who want to have a library of HD video available for their device, it's excellent.